When you embark on a trip that takes you far away from the comforts of your home-whether it's to an exotic location situated halfway around the world or a tiny town across the closest state line-a mixture of excitement, anxiety, and eager anticipation accompanies you on your journey. Arriving at your destination, you encounter a wide array of unfamiliar faces waiting to make your acquaintance and geographical locations you have been longing to discover. When the time comes to explore the uncharted territory that lies before you, what determines the way you react to your surroundings and how you interact with the people who call such places home? In her compilation of thirteen travel essays, author R. A. Voss sheds lights on the pivotal role our upbringing and past experiences play in our response to new cities, countries, and foreign cultures. Although many of the essays detail events that occurred on journeys taken to faraway lands-Japan, Germany, Israel-all of the pieces that comprise the collection hearken back to the author's personal history and the way her childhood in Iowa continues to influence her perception of the places she visits today. Using her experiences in her hometown as well as foreign lands across the globe as a guide, Voss touches on topics that range from issues society faces in the twenty-first century-such as equal rights and environmental sustainability-to her own attempts to trace her family's ancestry and discover her heritage. As she recalls the places she has visited and the people with whom she has interacted, Voss shares with readers that every individual we encounter is kept in our consciousness forever and shapes our future viewpoints and perceptions. Because we carry these experiences and interactions with us wherever our journeys ultimately take us, we never travel anywhere on this earth alone. Born and raised in eastern Iowa, R. A. Voss is a Vietnam-era veteran and retired registered nurse whose service has provided her with a unique perspective of the world. She earned a bachelor's degree from the University of Iowa and a Master of Fine Arts degree in creative writing from Chatham University, where she also completed a concentration in travel writing. Over the years, her travels have taken her to nearly all fifty states as well as countries as far-reaching as France, Germany, Greece, Israel, Australia, Austria, England, Ireland, Scotland, Italy, Mexico, Canada, Switzerland, and Japan. Her unhurried exploration of new destinations has given her the opportunity to absorb each location's unique geography and to familiarize herself with the fascinating people who call such places home. 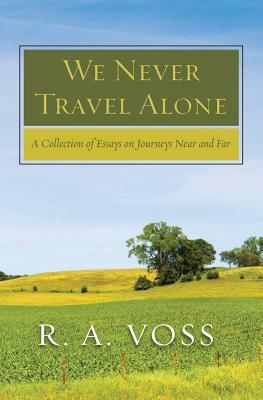 We Never Travel Alone is Voss's first book-length endeavor; however, her articles, essays, and reviews have been published in local and regional newspapers and journals.